Welcome! I just grabbed some warm bread from Utica Bread and picked a bouquet from the garden for my small table. Come on in! 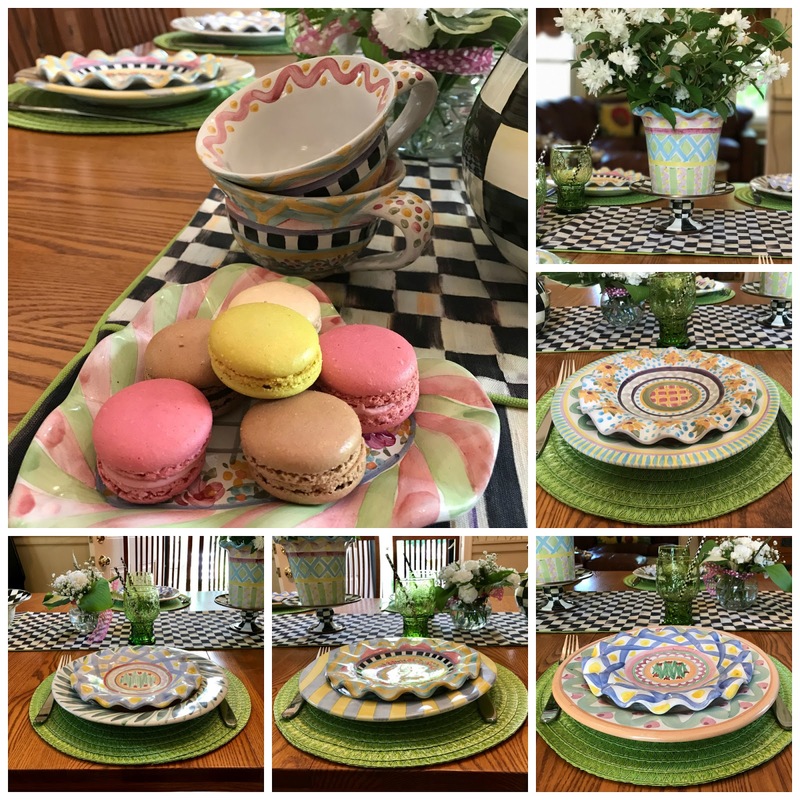 I'd love to have all my blogging friends at my MacKenzie-Childs table! It all started 25 years ago when my co-workers happened upon MacKenzie-Childs in Aurora. It sure has made entertaining fun! Joe decided to add his Tommy Bahama "Relax" hat to my small table display...lol...this man always makes me laugh. He is very relaxed this summer. I've set the table where we have been enjoying several meals this summer. Sometimes I bring the same place settings to the outdoor table. And I invite you to do the same today! Set a pretty table and dine alfresco. It makes eating a meal more special. I wish you could all be here with us today! I usually start with the MacKenzie-Childs Courtly Check table runner. The monochrome beauty and stark contrast of black and white captures the eye just as a splash of vibrant colors can. There is a story behind each ceramic plate...the artist that created it, the memories it holds from family get togethers, dinner parties and informal garden parties with my mom, grandmother and husband. I still remember when I set up a banquet table on our lawn and we ate under the stars. 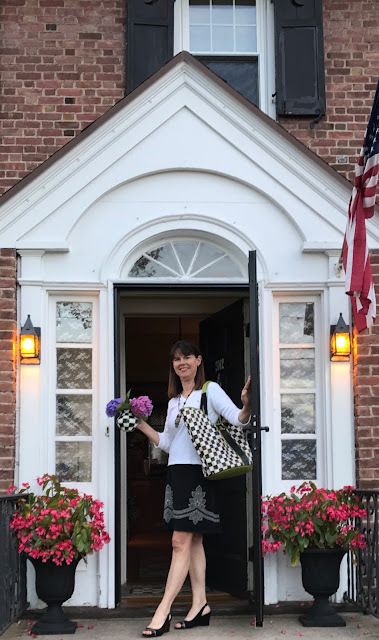 I am joining my fellow Traveling Tote group, and hope you will visit their summer tables. Very pretty table with the ceramics! Joe certainly knows how to complete the setting with his final touch!! I love the summer table theme for the traveling totes! 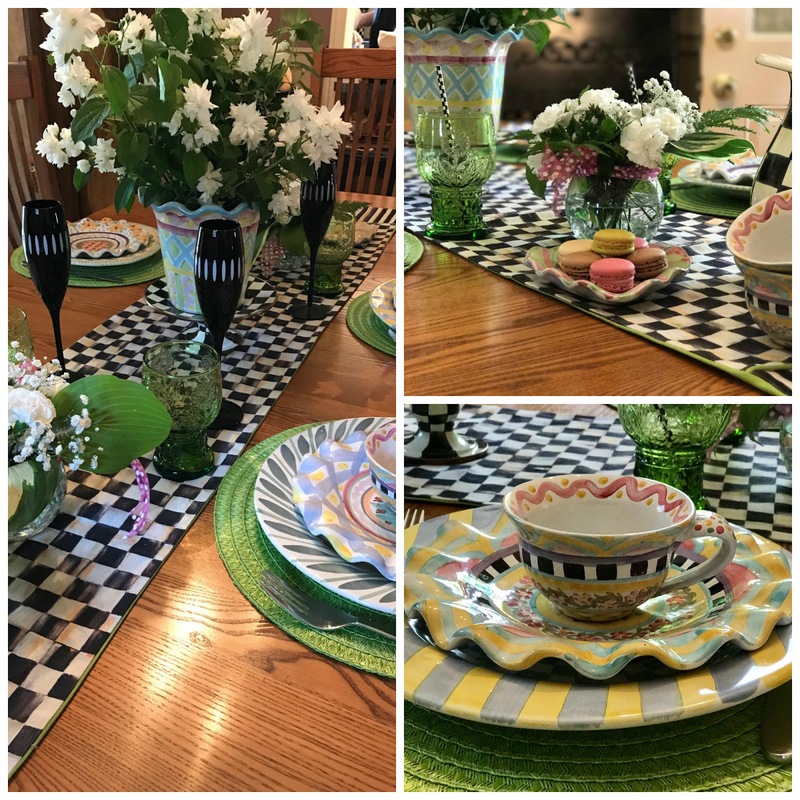 Your table is stunning....I love the lime green placemats with the Courtly Check and other MacKenzie-Childs patterns. I also like how you used the dinner plates as chargers. Your fluted heart shaped MacKenzie-Childs plate is *to die for* How in the world did I miss that one? Debbie, your table is so elegant yet perfect to enjoy casually. Tell Joe I think his Relax cap is the perfect touch to your tote centerpiece. Love the runner and perfectly matched green place mats. Your Taylor pieces are calling my name, I'm trying to resist that tempting call too! Lovely setting. Hi Debbie, your table is so cute. Joe adding his relax hat is super funny. That is something my hubby would do. Love the Taylor dishes! You certainly had fun with this table. Also loving the MKC runner. You have created a lovely tablescape with the Miss Aurora. Debbie, I would happily join you at this gorgeous table. You know the Taylor pieces mixed with the CC is my favorite look. You look adorable at your door. You could be the poster girl for MacKenzie-Childs. Thanks for sharing this beautiful table. Tell Joe, he gets extra points from me! Debbie, this looks so appealing to me. Basic and elegant - great, descriptive words for the MKC line of products. And just like the MKC line, you're very classy. Joe is too. :) What a way to start August. I LOVE Joe's addition to your small table, Debbie! All your tablesettings are so pretty, and the runner is so classic. You, my dear, are picture perfect as you welcomed us inside. Debbie, your MC table is so pretty, elegant, and whimsical. The colors and shapes are appealing, magical. I have longed for a MC gate--one day! Debbie your table looks positively dreamy. I love all your dishes and your table accessories. And I could inhale the dessert in one sitting. Hope your week is as sweet as your table! You take MC to a whole, new level, Debbie ♥ I have the bowl vase but in red and yellow stripe :) Beautiful table!